As we all know, the summer means high temperatures, tans, and overheating, and just like us, dogs want to cool down and have fun in a cold and refreshing pool. Not a lot of dog owners know how dangerous the summer heat can be for dogs, so one of the best ways to keep your pet cool is choosing a dog pool that’s best for them. With lots of different options out there on the market, it can be difficult to choose the perfect pool for your canine, which is why we’ve come up with a guide below to help you decide. Scroll down to read about Why Should You Buy a Dog Pool, Why Can’t You Just Buy a Kiddie Pool, whether or not Should You Supervise Your Dog and finally What to Look For in a Dog Pool. Solid dog pools are known to be more durable than inflatable and foldable dog pools and are less prone to deteriorate in the sun. These pools are usually made of polyurethane (or truck bed liner) and can withstand some serious damage that dogs can do compared to inflatable pools, but they can be a bit of a problem if easy storage is important to you. Cleverly shaped like a dog’s paw, this doggie pool is ideal for those who want a decent solid pool that their dog can enjoy themselves in. It’s made with truck bed liner material for durability and strength, measuring out to be 6″ X 38″ x 39″. You can fill the pool with up to 20 gallons of water all the way up to the top, and when you want to drain it, the pool flexes for easier draining time. If your dog likes to chew things, luckily this pool is chew and UV resistant. This is a great pool for smaller sized dogs with some users saying that they could fit at least two corgis in the same pool. 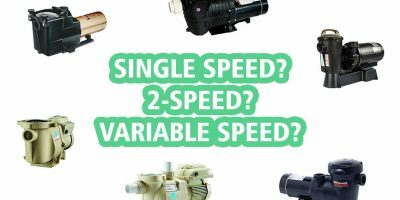 Many have also reported that it’s easy to empty, and because of the small size, it’s also easy to clean. Although, some may prefer a drain plug for more convenience, and if you have a larger sized dog (over 60 pounds) this pool may be a tight fit. Foldable dog pools are easily collapsible and more portable than solid one-piece dog pools. 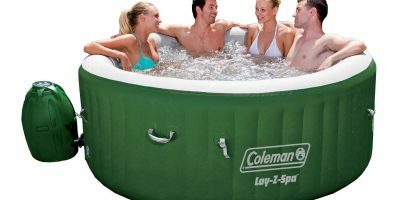 Compared to inflatable ones, foldable pools are stronger and more dependable, but not as durable as solid pools. Otherwise, they are easy to store away and set up for when your dog wants a nice swim. If you don’t want to break the bank on a dog pool, this foldable pool is a great deal, not to mention it can even serve as a bathtub to clean your pet. It’s made of quality PVC waterproof cloth and the corners are well sealed to prevent leaking. The size measures out to be 32 inches in diameter and 8 inches deep, and can hold up to 6 inches of water. The waterproof material makes it effortless to clean and it’s compact enough to take with you anywhere. The plug in the bottom allows for smooth drainage when it’s time to pack it up. This is a particularly large dog pool that’s perfect for medium and large dogs. 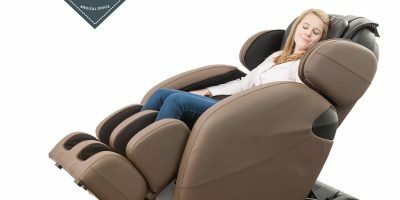 It has a diameter of 50 inches and is about a foot deep, constructed from extra tough PVC material that’s made to last. It’s simple to use for all you need to do is fill it with water and then open the drainage hole to empty out the water before cleaning and storage. It’s also portable since it folds up small enough to take it with you wherever you and your dog go. Some users note that the bottom is thin so it can puncture easily, especially if you have dogs with sharp claws. The side walls are also not very strong against dogs that like to chew, for some users’ dogs have ripped the walls apart. Other than that, the pool’s size is big enough to fit several dogs and the drain spout is easy to loosen and tighten to prevent leakage. This pet swimming pool is made of strong PVC cloth to prevent leaks and tears, along with a high temperature resistance so it won’t be as sensitive to the heat and outdoor sunlight. 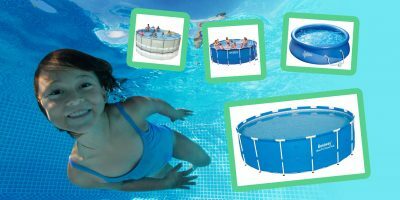 With a built-in upholder, the pool won’t easily collapse even when it’s full of water, and the drainage hole at the bottom make it easy to drain when you’re not using it. The pool is 32 inches in diameter and 8 inches in height, making it suitable for dogs with a body length under 28 inches. It only weighs around 3 pounds and turns into a compact size to store and carry for when you’re traveling or camping. Small to medium dogs can swim around in this pool comfortably, but big dogs can probably only sit in it. Many love the fact that the pool folds up into a size of a textbook for convenient storage, and is durable enough to last through the summer. There aren’t many negative things about this pool that users have noted except for the placement of the drainage plug. Since it’s on the bottom of the pool, you have to lift up the side of the pool so that the water drains more smoothly. Bathing or keeping your dog cool can’t get any easier with this foldable pool by Kopeks. 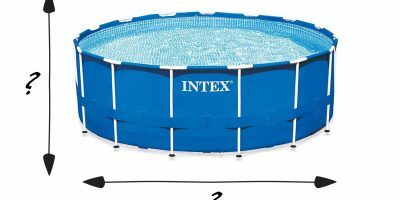 Your puppy can swim around in this easy to use pool that measures out to be 47 inches in diameter and 12 inches deep. You don’t need to inflate since the pool sets itself up in no time by just filling it up with water. The twist off cap makes for stress-free draining for when you need to clean and pack up the pool. Its heavy-duty strong material is made of industrial strength PVC to prevent the pool from getting any holes or tears. A convenient plastic carrying case makes it that much easier to take the pool anywhere you want. A lot of users have mentioned how easy setting up the pool was, and is sturdy enough for rough playing puppies. Medium to large dogs may not be as comfortable as smaller dogs though, and caution is advised if your dog likes to chew. Heatstrokes and overheating are both possible and very dangerous in the summertime for your dog, so dog pools are a fantastic way of cooling off your canine fast. There are many studies that have found how easily dogs can overheat in the hot sun without enough water, so it’s highly important that you provide plenty of drinking water and a dog pool to cool off their bodies. Although you have the option of hosing down your dog every now and then, this may become more of a chore than anything. Dog pools are more convenient for it saves water and time, which is why they’ve always been one of the best options. Who doesn’t like seeing their dog having fun and splashing around in refreshing water? Can’t I just buy a kiddie pool for my dog? The huge difference between dog pools and kiddie pools is durability. Kiddie pools are mostly inflatable and made for soft hands and feet of an infant or toddler, whereas a dog pool is designed for 60-100 pound furballs with claws and made so that they won’t easily tear, rip, or break. There’s also a concern for hygiene. If you buy a kiddie pool for your kids to use but also occasionally let your dog use it and soak, this could bring in a lot of bacteria and dirt which might make the pool unsafe. Otherwise, if you have a kiddie pool that no one uses, you can feel free to let your dog have fun in it, but don’t expect it to last very long, especially if your canine is energetic and playful! Do I have to supervise my dog in the pool? Much like infants and toddlers, it’s not the best idea to leave your dog unsupervised, especially if they’re only a few months old. While there’s more of a danger with water deep enough for your dog to swim in, shallow water also has its dangers. To disgress from the topic of dog pools slightly, dogs in larger in-ground/above-ground pools can tire themselves out and panic if they can’t find an exit from pool or fall asleep in more shallow above ground pools, and without supervision, they can risk drowning themselves. You can watch a video below for more information on dog pool safety and get an idea of what kind of precautions to take (such as installing a ramp) before letting your dog swim. What do I look for in a dog pool? When you’re ready to buy a dog pool, there are several things to consider before making the final choice. Dog pools can be one-piece, inflatable, or foldable. One-piece – One piece (or solid) pools are the strongest type, but since they’re made of heavy-duty thick plastic, this makes it hard to stow them away since they’re not as flexible and compact as inflatable or foldable pools. Inflatable – Inflatable dog pools are more for smaller dogs and are to be used occasionally. They can be easily punctured or scratched by claws, and even a tiny hole can ruin an inflatable pool. While they can save lots of space, inflating the pool can be quite the chore after a while. These don’t seem to be very popular, and so we didn’t review this type below. Foldable – These are more reliable than inflatable pools because they’re stronger and can last throughout multiple summers. But a word of warning, the materials used to make a foldable pool can affect its quality, so make sure the material is durable and watertight, also keeping in mind that the panels inside the foldable walls are plastic, not cardboard, which is the case with some inferior products. PVC – This is the most common material but also the most reliable and flexible if you’re buying a foldable or inflatable dog pool. All of the foldable dog pools we’ve listed such as the Fuloon Foldable Pet Swimming Pool and Ethical Products Cool Pool are made of PVC material. Metal – Metal, when properly coated, can be resistant to weather and rust. There aren’t many metal dog pools out there on the market, but you can use agricultural stock tanks. Keep in mind that these tanks can be pretty deep, so consider the size of your dog before buying one. Polyurethane – Also called truck bed liner, polyurethane is a durable polymer that can stand against heavy paws and is usually for one-piece dog pools. 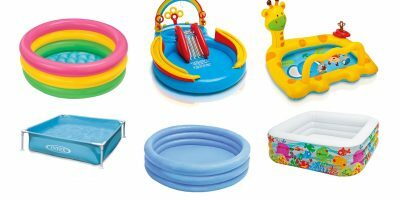 The listed One Dog One Bone Paw and Bone-Shaped Play Pool and the Behlen Country Deluxe Fun pool are made of polyurethane. Dogs come in different shapes and sizes, so it’s important to know what size dog pool would be best so your dog can fit in it comfortably. If your dog isn’t too energetic and will enjoy just sitting or lying in the water, then the pool doesn’t have to be as big or deep as those meant for splashing and swimming. If your dog does like swimming, measure your dog from their nose to the base of their tail to compare their size to the pool’s size. Dog pools big enough for Labradors or border Collies may be hard to find, but smaller dogs can swim in pools that are made for large dogs. Large dogs are usually able to step or jump over the walls of a pool, but for smaller dogs, it can be tricky getting in and out of the dog pool if the walls are too high for them to walk or jump over. Also, if your dog is older and has mobility issues, a ramp is definitely a necessary addition. With this in mind, along with buying a dog pool, you might also need a ramp or a couple of steps so they can climb in easily. Dog pools can be anywhere from $20 to $500 or more, and the general rule of thumb is that you’re going to spend more for top-of-the-line pools. Contrary to popular belief, cheaper dog pools don’t necessarily mean that they’re low quality, and more expensive dog pools doesn’t mean they’re good quality. The main focus should be on the material (which accounts for the pool’s durability) type, and size. Your dog can swim or cool off in a refreshing dog pool that’s perfect for those hot summer days, and luckily, there are plenty of options on the market so you can decide on which pool is best for your furry canine friend!